Flavored fizzy drink mix containing Vitamin C, Manganese, Zinc, Electrolytes and seven B Vitamins. Emergen-C Plus Probiotics flavor also contains probiotics. 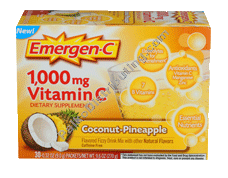 Emergen-C 1,000 mg. Vitamin C Dietary Supplement is a delightful fizzy drink mix providingVitamin C, Manganese, Zinc, Electrolytes and seven B Vitamins. Vegetarian. Contains Natural Sweeteners. Caffeine free and Gluten free.